I bought a new pear tree, Williams Bon Chretien, from a local garden centre yesterday and put it in the ground following the instructions. Watered roots while in its pot before planting, dug the hole suitable size and filled with the recommended soil and got it in with a stake and rubber tree tie facing into the most common prevailing wind. However the wind sometimes feels like it can come from any direction and it's not unknown to knock over some plant pots around the garden. 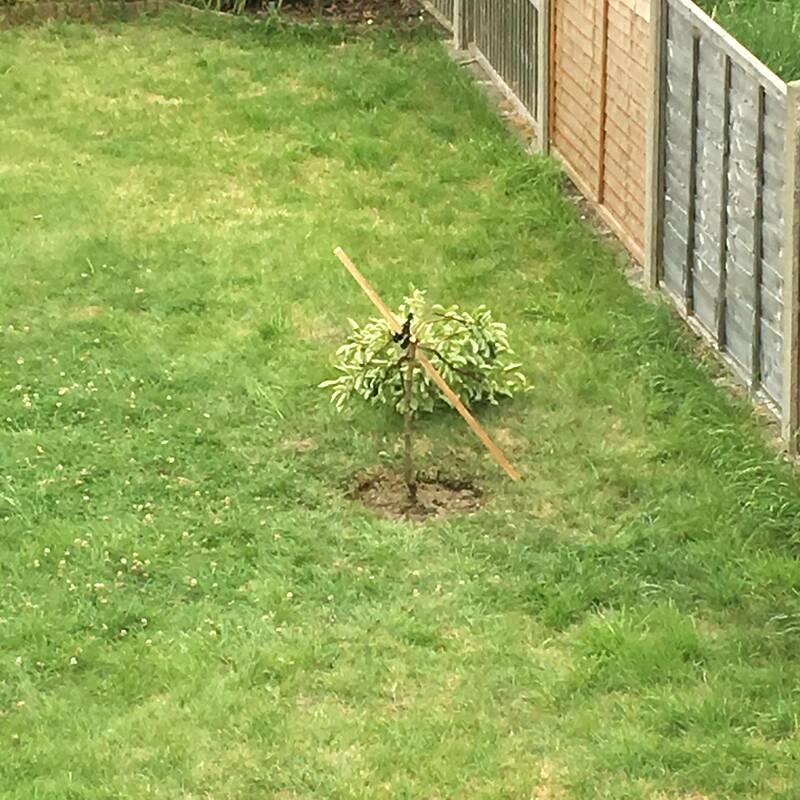 Spot too windy for a tree? Stake and tie not being suitable? Was the tree not good quality from the garden centre? Stake badly positioned? Weak tree type and a different type would work? The tree and the stake are solid in the ground still and the tree has snapped a bit under where the stake is tied as can be seen in the photos. I may have put the stake in too high/low? The garden is surrounded by other gardens so I am confident to rule out animals causing this. I feel like this tree cannot be saved. If it can be could you point me in the right direction? I would still love to have a tree in this spot and neighbours have trees, any tips are appreciated. I hate to go against the content of the comments from our other contributors but this tree is a write-off. It looks like you are in a small suburban garden where you do not have space for trees that are not going to look nice or produce for many years. 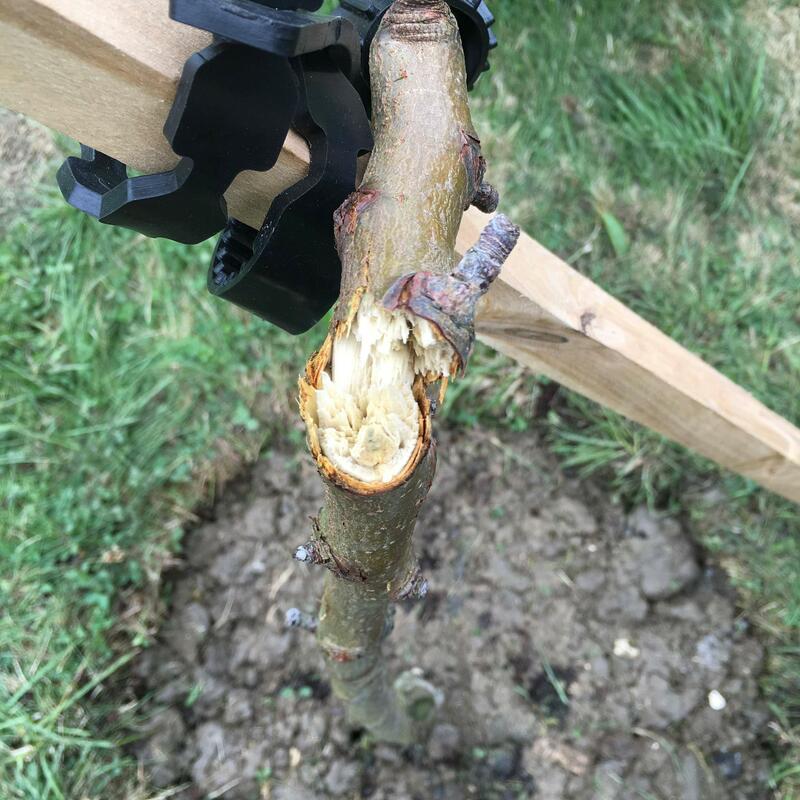 The break is above any graft point so it will rebud with fruit bearing growth but you will have lost a few years before it will establish any branch structure. after planting the new tree cut back the branches to establish a solid structure. See this excellent answer for more on pears. This will decrease the weight the trunk has to support until it establishes itself. As to why it broke I suspect the branch that has been cut off near the break was a point of weakness. Without a more detailed inspection it's hard to tell. Not the answer you're looking for? Browse other questions tagged trees fruit-trees tree-care pear wind-damage or ask your own question. Why is my pear tree blooming in September?